**I have learned that it takes approx. 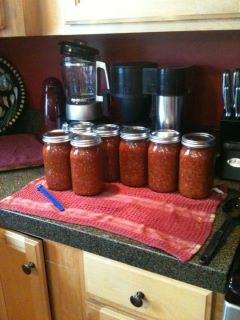 10 average sized canning tomatoes to equal 8 cups of food-processed tomatoes. Tomato Prep: Blanch tomatoes to remove skins. Cut tomatoes into quarters and run through food processor. Drain some of the juices if you prefer a thicker sauce, otherwise you may leave as is and simply add a small can of tomato paste down the road when preparing a meal for your family. Set aside. If you do not have a food processor, you may use a food mill. To use a food mill, do the following: Core and quarter tomatoes, place a small amount of tomatoes in large stainless steel stock pot. Place on high heat and crush using a potato masher. Slowly add more tomatoes and crush each new addition until all tomatoes have been added. Work quickly to avoid scorching the tomatoes. When all have been added, reduce heat to simmer and boil gently for about 10 minutes, or until tomatoes are soft. Working in batches, press tomato mixture through your food mill. Discard and peels and seeds. Drain some of the juices if you prefer a thicker sauce, otherwise you may leave as is and simply add a small can of tomato paste down the road when preparing a meal for your family. Set aside. Chile Puree: Take 14 dried California Chile Peppers and remove the stem and any excess seeds. Place in a stainless steel bowl and cover with hot tap water. Place a bowl on top of the chilies to keep them submerged. After 15 minutes, remove the water-soaked chilies and a 1/2 cup of the juice and place in a food processor. Blend on high to produce a puree-like substance. Set aside. Meat/Spices: In a large stock pot, brown sausage/hamburger. Drain fat – optional because if you’re like me, I use lean burger so there is limited fat content. Once the meat is cooked through, add onions, peppers, garlic, mushroom, parsley, basil, oregano, salt and black pepper. Add a splash of water to aid in softening the onions/peppers. Cook on medium heat until onions are clear and peppers are soft. Add the tomato and Chile puree to the meat mixture. Stir in any remaining ingredients. Bring to a boil over medium heat, stirring occasionally, for 5 minutes, until heated through. Do NOT over cook as you run the risk of scorching your sauce. Now simply hot pack into quart size jars leaving 1 inch of head space, wipe rims and secure using lids and rings. Pressure cook at 10 pounds of pressure for 70 minutes.